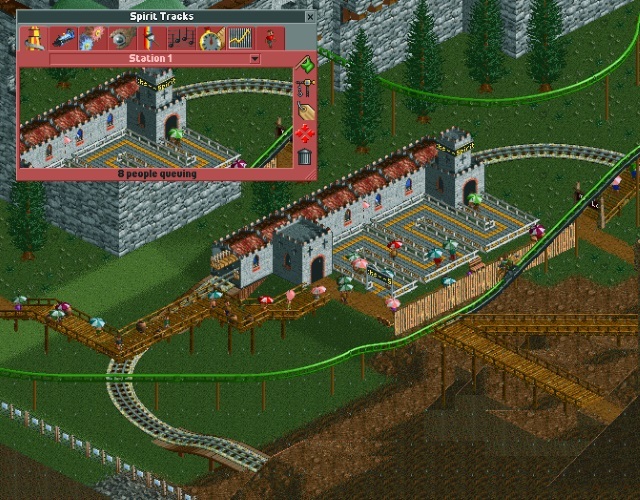 There is now a Monorail station inside Peach's Castle, and proving to very popular indeed. 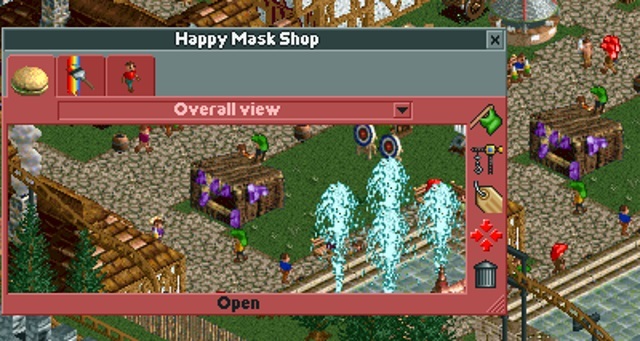 As per Kess' request (despite being fairly late) there is now a hat stall in Castle Town called the "Happy Mask Shop", coloured purple as it is selling the most dangerous mask of all: Majora's Mask! And a couple of utilities, which have surprisingly been named on the spot: "Star Toilet" (again, not very imaginative on my part) and "The Observatory", getting a little Mario Galaxy reference in. Decided to name some staff as well. The mechanic patrolling the Luigi's Mansion area is now called "Professor E.Gadd", whilst the mechanic and handyman patrolling Peach's Castle are simply now "Toad mechanic" and "Toad handyman". Out of curiosity, how did you convert the kirby music? What Kess says ... with a minecart style coaster please. Kesskuron wrote: Out of curiosity, how did you convert the kirby music? And then it will be there in game. 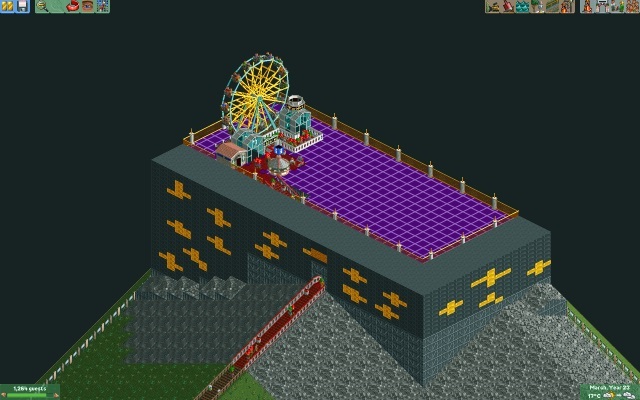 The only annoying thing is, especially for our Nintendo Land park, is that the limit of only 2 custom music slots means we can't have each ride playing their own respective theme song or piece of music. And don't worry about a Donkey Kong ride. That is the next ride on the list. I eluded to it in MINI Update 1.5, it's gonna go in the gap between "Kirby's Air Ride" and "Luigi's Mansion"
Here we go, a big request has been answered, and it has turned out better than expected! 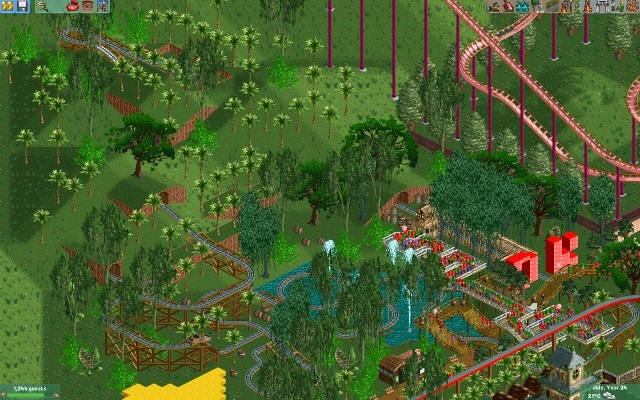 I present to you: Donkey Kong Country! Located between the Mushroom Kingdom, Star Road, Luigi's Mansion and Kirby's Air Ride. This was a fairly difficult build. 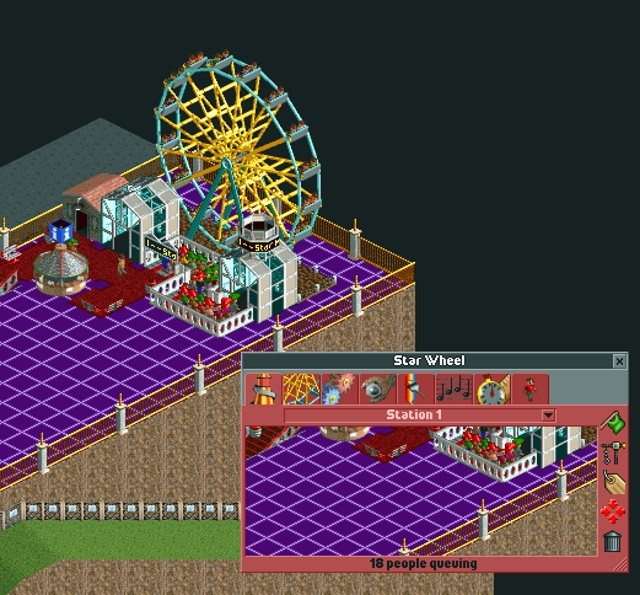 Had to test it several times, and even delete the whole ride once, simply because the intensity levels were too high. 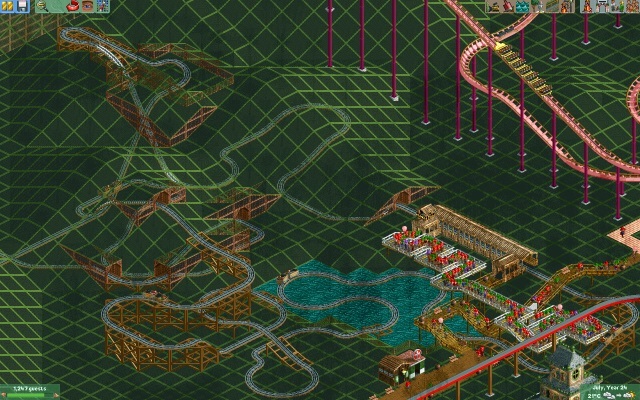 However, this particular mine cart ride is naturally high in intensity, due to tight turns, steep drops, and the main feature of the trains, they tilt as they go around corners (exactly why the ride is perfect to represent DKC!). The scenery is good and varied, mainly jungle trees, however there are plenty of barrels dotted around the place, and even some Piranha Plant-like foliage as well. 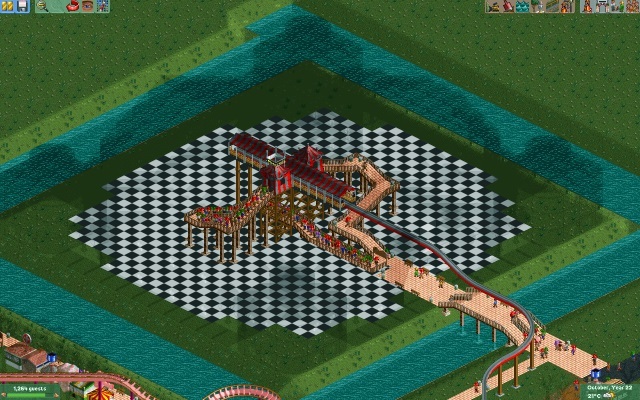 As always, it needs a name, most likely named after a mine cart level in one of the DKC games. 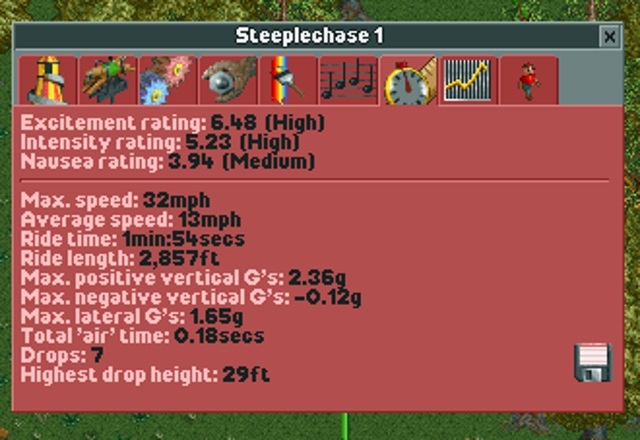 In terms of ride stats, it's still really high in intensity, yet excitement rating is also very high to combat that. And despite the high intensity, I'm surprised that there is a full queue already! 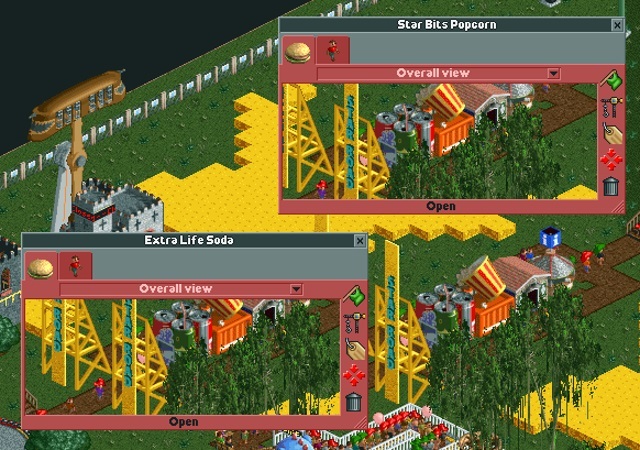 These were a must for the area, since the ride has a high nausea rating, so hopefully there won't be too much internal mess from the guests all over the path. 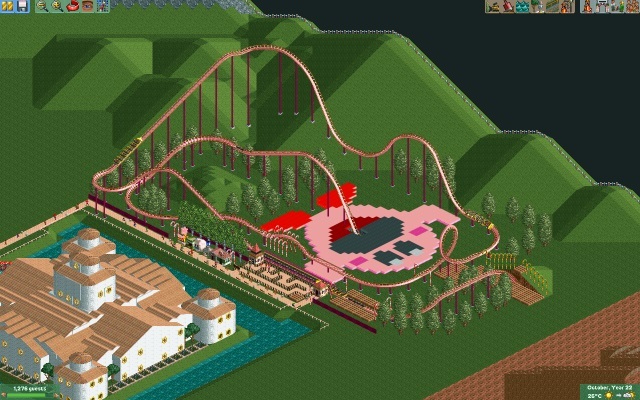 Also decided to connect it up to the pathway leading to Kirby's Air Ride, just for more convenience for the guests. Hidden among the jungle foliage and at the very end of the ride is a small DK initials sign, to emphasise who's area this is. And I just noticed what the in-game year is. Nintendo Land has been open for 24 years already, and it's only half done! Last edited by SupaWaluigi on Thu Aug 06, 2015 7:24 pm, edited 1 time in total. That looks awesome, great job. Love the theming and all the terrain variation in the ride. The whole bottom left - left sides of the park are pretty much complete now. Very few large rides will crop up here now since room is scarce, but that does not mean we won't be revisiting these areas in future updates, as there are still many rides and shops/stalls that still need to be named, and plenty more gentle and thrill rides that won't fit in other areas can be constructed here later by your requests. HERE IT IS: Rainbow Road! 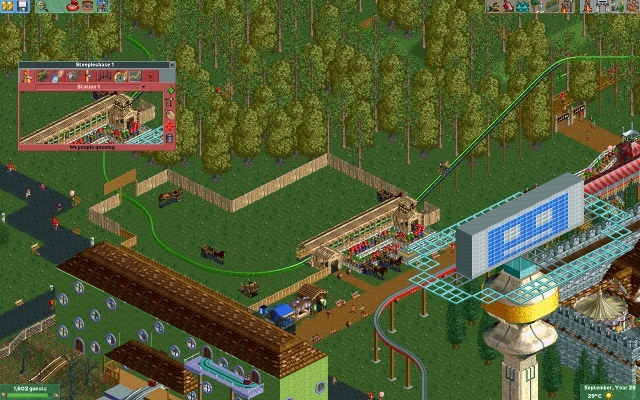 Another complicated rollercoaster build, especially because it's essentially in reverse, no lift chains at the start, mostly at the end of the ride, in order for the train to make it back to the station. 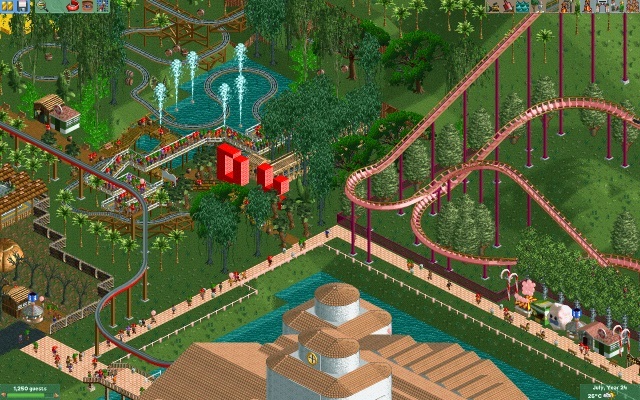 A closer look at the coaster. 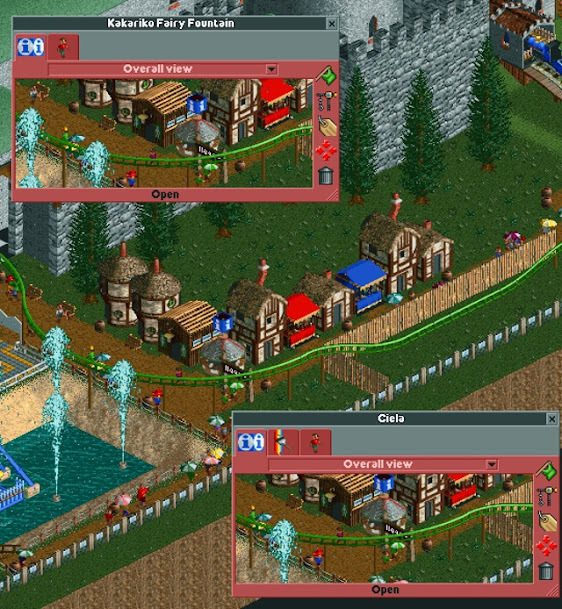 The game only allows 4 alternate colour schemes per piece of track, so it is mainly blue, red, yellow and green for the main body of the track, with different coloured rails on the edges. 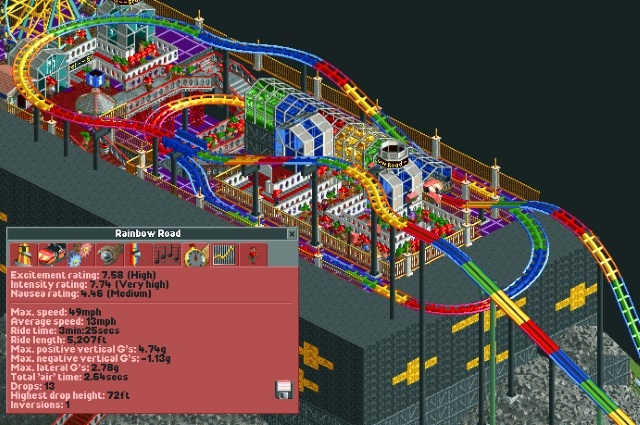 Also, tried to make up for this limitation by having a multicoloured coaster train as well. 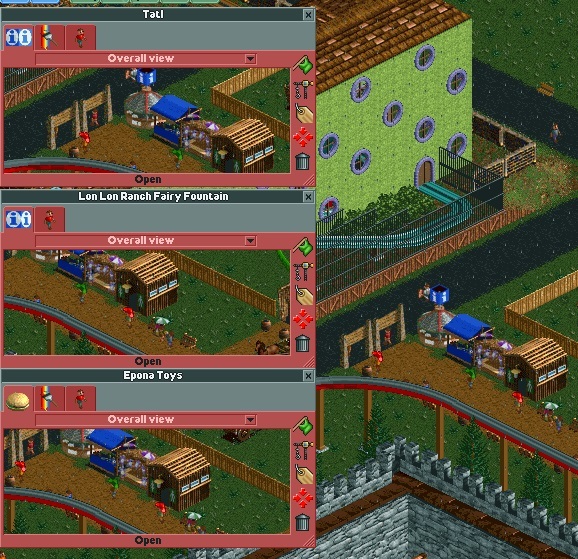 I seem to have a knack for building very intense rides, but that is not stopping the guests at all! As always, stay tuned in to this thread for more updates. And keep suggesting ideas and names, I feel like this thread is losing steam a little since very few people regularly comment and participate. ALL ARE WELCOME HERE IN NINTENDO LAND!!! That rainbow road looks insane. And therefore it matches rainbow road perfectly. I wouldn't worry about it only having four colours - it's still obvious enough that it's a rainbow! 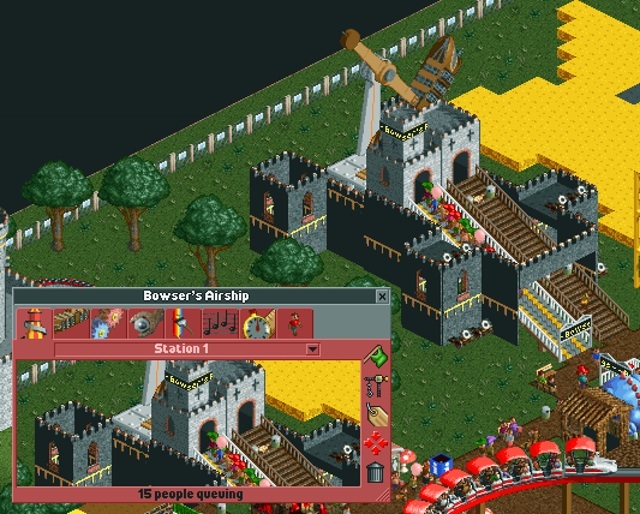 Bowser's Airship is spot-on too! Ooh, yeah. Those new rides look great. It's a shame we couldn't have something F-Zero related. There are toboggan rides you can have, right? I think that might be good for an F-Zero related track. 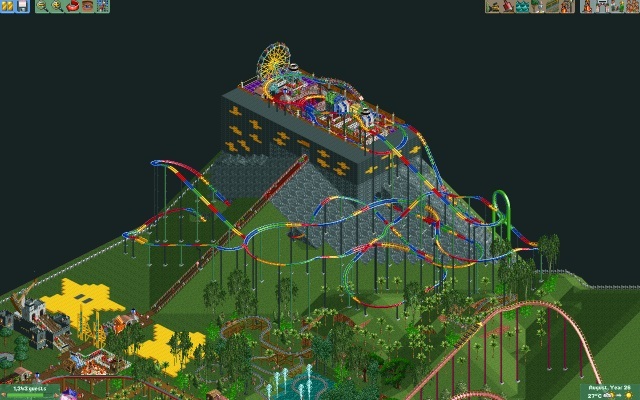 Rainbow Road/Ride looks stunning, major kudos to you! I'd love to see a warp pipe section, maybe bumper cars or something like that. And an area for Metroid too. Lovin the rainbow road and Bowser's ship. Here's an idea: two giant Pong drop towers, at either side of the park. Or if Pong isn't Nintendo-y enough, they could be Tetris drop towers. DarkRula wrote: Ooh, yeah. 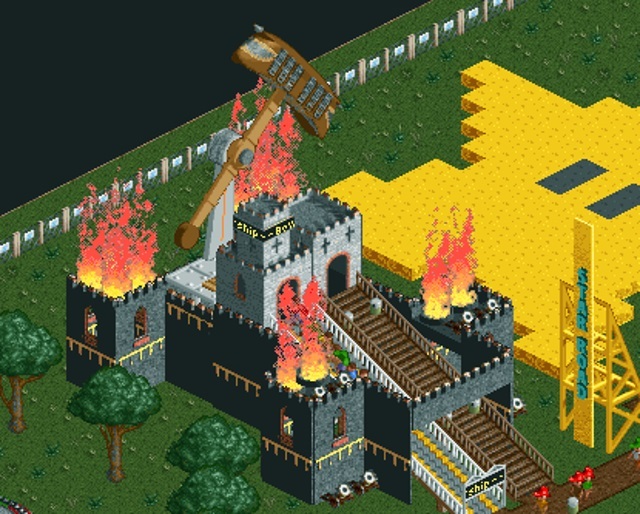 Those new rides look great. It's a shame we couldn't have something F-Zero related. There are toboggan rides you can have, right? I think that might be good for an F-Zero related track. Maybe the Pikmin area could be a giant maze, to make it seem like we're the Pikmin lost in a giant garden and then there could be animatronic Bulborbs at different parts of the maze. And some days scavenger hunts could be held there, where we must find the different items the Pkimin discover like batteries or those red circles with Number Ones on them. Olimar's ship would be at the other side of the maze (where you come out at the end). We could go in it for one of those motion ride things, with a screen showing us "flying" through the Pikmin universe. And at night time, when the park is closing, the ship could be lifted into the sky to make it look like Olimar's flying away. The Pikmin's bulb-shaped ship could also be there, next to Olimar's. It would be used as a shop with Pikmin plushies. 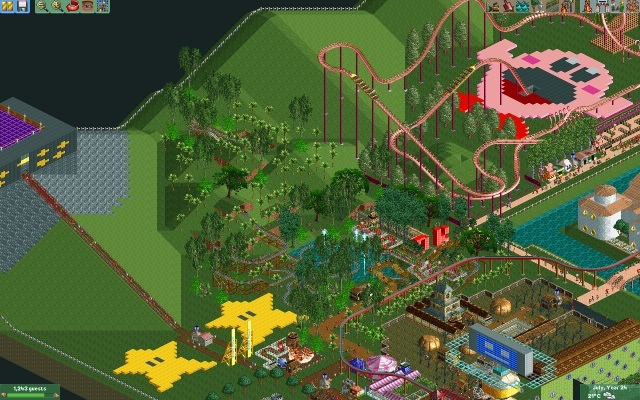 As a point of trivia I did a similar thing in RCT3 once, based on ONM and the forums, but this is way better than that ever was. Heading back over to Hyrule for this update. 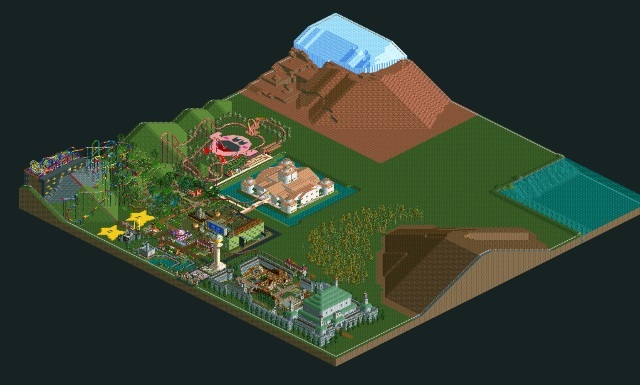 Plenty more rides have been built, but first a (bit skewed) Park Progress Overview, #3 to be exact. Doesn't look like much has changed, has it? 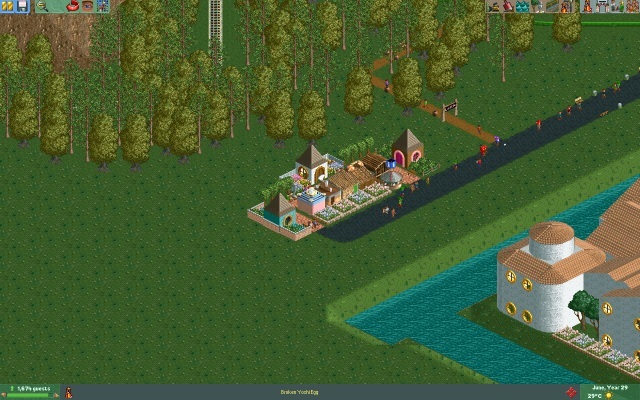 But the Lost Woods is now a bit more, well, woody, whilst also becoming full of rides and paths. ...And finishes back in Lon Lon Ranch. Of course, guests are riding Epona carts, taking them through their very own Legend of Zelda adventure! And the stats are pretty good as well. This is going to very popular with park goers. Just outside the ranch, there are a couple of shops and stalls. We have an information kiosk named after Tatl the fairy, Epona Toys Souvenir Stall, and the Lon Lon Ranch Fairy Fountain Toilet. 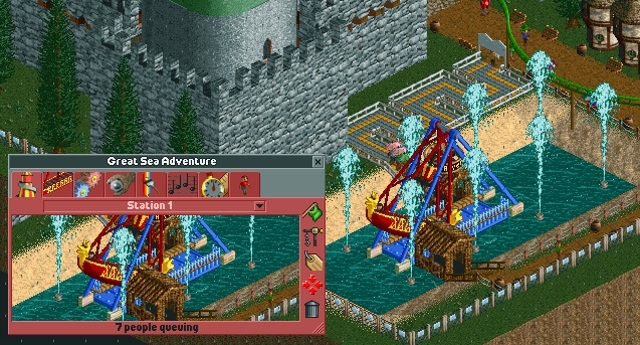 Not only that, but we have a couple of developments behind Hyrule Castle, one being a swinging pirate ship, in King of Red Lions colours, called The Great Sea Adventure. But nearby, we have Kakariko Village being constructed, housing a few more shops and stalls! 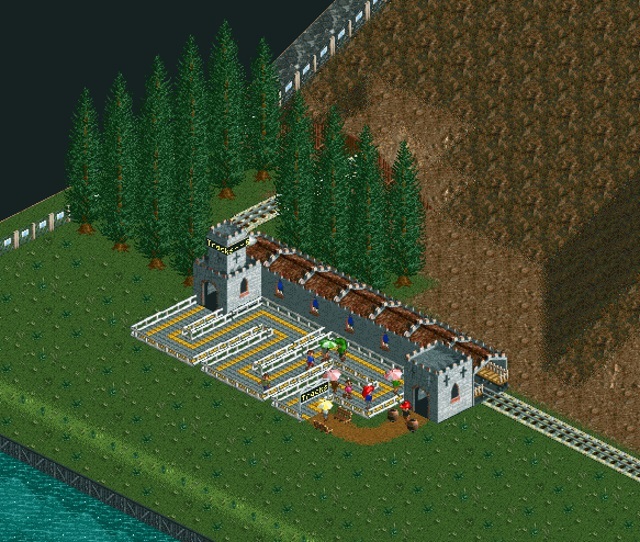 Now, despite being a little too early for this, I decided to build a transport system to get from Hyrule to the soon-to-be Space themed area, and what better theme to go for than Spirit Tracks. As you can see, Not much to see here. 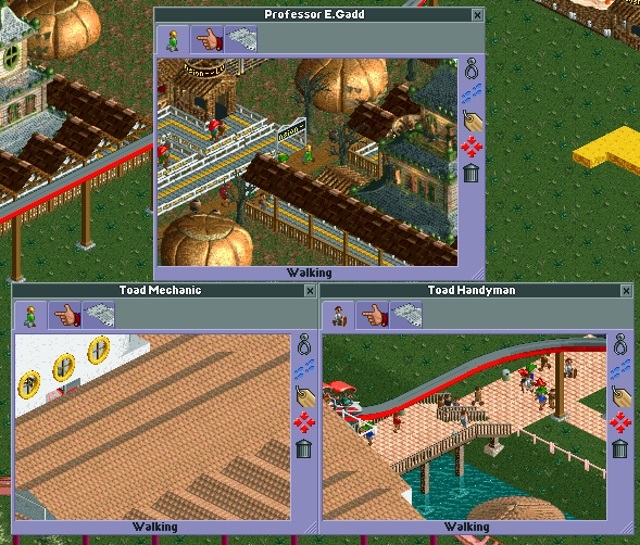 Guests who get off here immediately have to get back on for now. 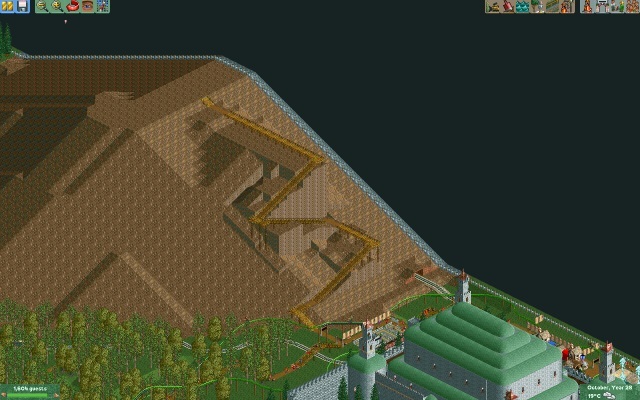 Also been trying to figure out a good, mountain-y way to build a path up the side of Death Mountain. 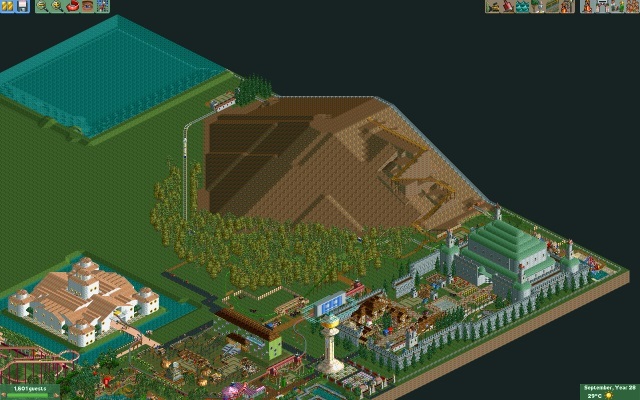 I do have chairlifts, but I'm gonna save them for the other mountain as it will fit in better. That's it for Update #6. 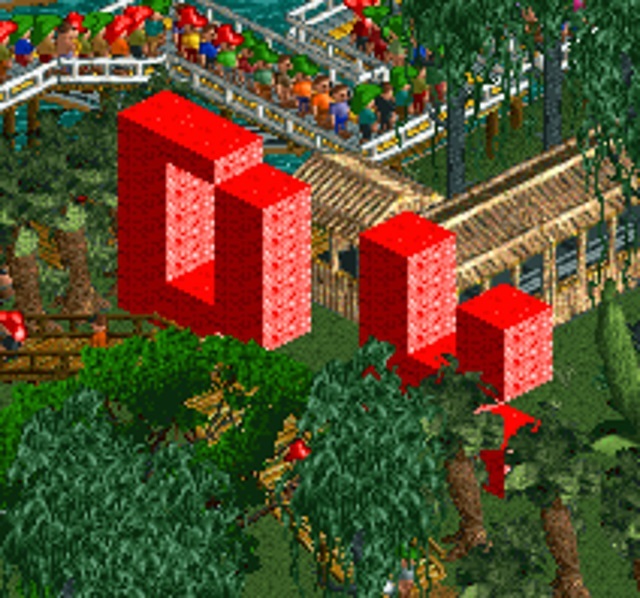 Reading your posts about a Pikmin themed area and rides, I really like them, but I need to think about a really good way of representing it. 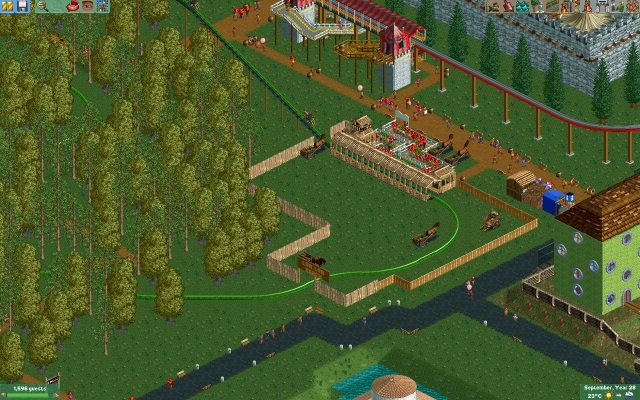 The idea of having a maze makes sense and works incredibly well, and now that the Lost Woods is full of coasters, trains and pathways, I think the maze will be perfect. Hang on a tick. 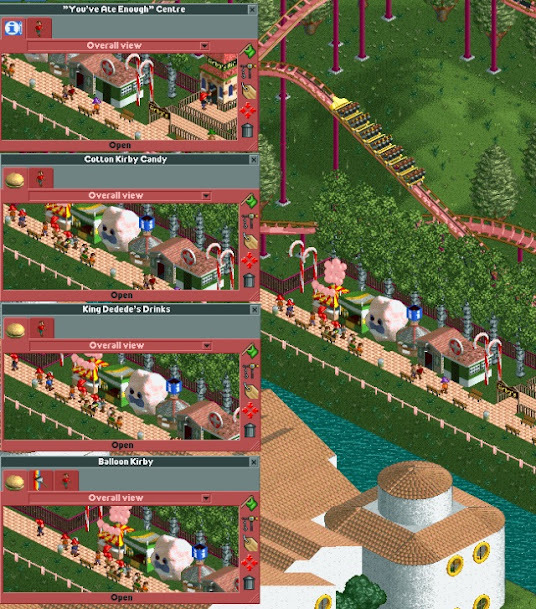 I found out that RCT2 has princess entertainers. With that in mind, why don't you add entertainers of Peach, Zelda and Rosalina to the park? Would make for a nice little addition. Wow so much work since I last checked in here. I'm wondering if you're gonna have room for anything Splatoon themed. Possibly a water slide would be fitting.. even though Splatoon squids die in water..
Love the fire on Bowsers Castle .. perhaps a little at the edges of the ride to entertain the queueing guests or at the place where the queue starts to get them hyped? Zelda area best area though. You should put some fire around the path leading up death mountain too maybe? A little scenic Animal Crossing Village! One of the few things I absolutely worry about when doing this project has finally happened. 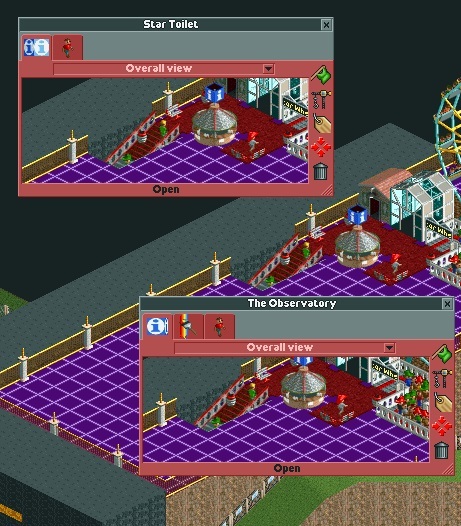 I have been constructing one of the new areas with one of the absolute major rides in for at least 2 hours now. I am playing RCT2 and uploading stuff on my laptop (I do not have a decent PC and this laptop is pretty old and decrepit now), and the battery is pretty much dead, so needs to constantly be charged. And guess what?! My mum comes in, starts cleaning stuff up, and accidentally unplugs the charging unit, shutting down my laptop immediately! And to make matters worse, I hadn't saved since that MINI update above! That's why my mother's locked up in a basement somewhere. Animal Crossing village is adorable. Number one rule of games and apps that everyone forgets. Save things during and not just at the end. This park is insanely awesome - ages ago me and a friend tried to design a Nintendo park but it came nothing close to the scale of this. Really liking the different areas - Metroid would be cool if you could make it work. 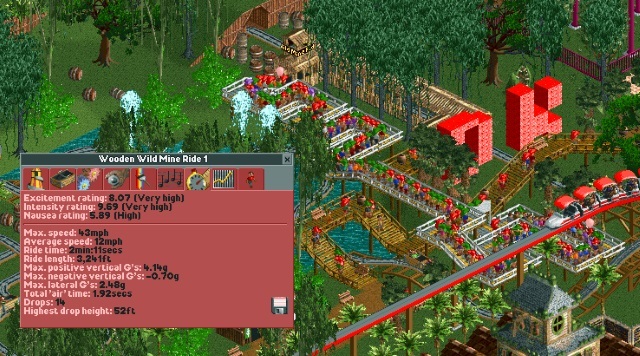 I forgot say, I'm very impressed with the Mine Cart ride! Also the sheer volume of attractions. Keep it up and this park is going to break the number of guests record for sure.